A Red Flag warning has been issued for Sebastian, Fellsmere, Vero Beach, and other areas of Indian River County. 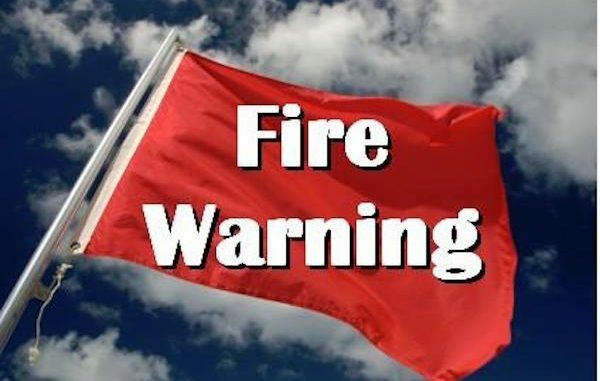 SEBASTIAN – The National Weather Service has issued a Red Flag warning in Sebastian, Fellsmere, Vero Beach, and other parts of Indian River County until 7:00 p.m. this evening. The fire weather warning was also issued for Brevard and St. Lucie Counties for the duration of low relative humidity values coupled with gusty northwest winds of up to 15 mph. “A Red Flag warning means that critical fire weather conditions are either occurring now … or will shortly,” the National Weather Service said. Any fires that develop in areas of Sebastian, Fellsmere, or Vero Beach will likely spread rapidly due to the weather. Outdoor burning is not recommended. Sebastian Daily will continue to monitor the warning throughout the day.